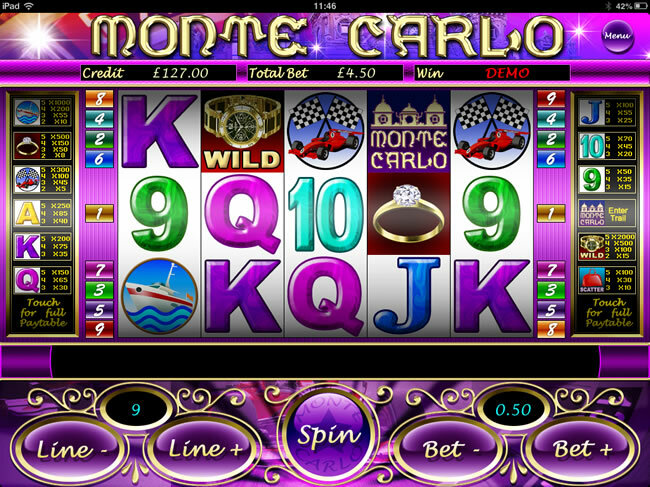 Monte Carlo is a 5 reel, 9 payline slot and if you’re always trying to locate the ‘Spin’ button you’re in luck – it’s the biggest thing on show here. It jostles for half the screen space with the Lines and Bet buttons plus a convenient ‘Paytable’ button to find out the various symbol pays. Symbols include plenty of icons that bring the luxury of Monte Carlo to mind, like a Yacht, Diamond Ring, Rolex Watch, Handbag, F1 Chequered Flags and 9-through-ace symbols. As you’d expect, the gold Rolex plays a key part, in this case the game’s Wild icon. It substitutes for all regular symbols other than the Scatters. Free spins in classic mFortune style can be yours if you hit three or more Handbag Scatters on the reels. Three Scatters “bags” you 5 free spins, four Scatters 7 spins and five Scatters 9 free spins. 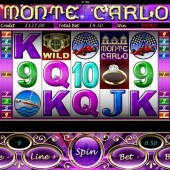 mFortune like to load their games with a little more than just free spins, however; a little mini-game can be triggered by landing three or more Monte Carlo logos on the reels. The game is basically a classic Trail Bonus round where your F1 car (Monte Carlo is the home of very fast car races as well as filthy rich inhabitants, remember) heads off round the track. You’ll pick up cash and multipliers on your journey round. mFortune’s games seem to follow a well-worn pattern – hit the 9 paylines and hope for the best – but if you are lucky enough to trigger one of the game’s bonus rounds riches are yours for the taking. OK, maybe not as big riches as one of Monte Carlo’s more down-at-heel residents, even, but certainly a jackpot that can at least get you as far as the airport departure lounge. If you like the way mFortune throws its weight around in the mobile slots world, there are plenty of decent alternatives out there – the comedy-themed Cat and Mouse or the hunt for riches Pirates Treasure affords mobile players are two decent places to kick off.